Sasago, a major road tunnel, has collapsed in Japan, trapping a number of vehicles and leaving seven people missing, local media reports say. The incident happened at about 08:00 local time, about 80 km (50 miles) west of Tokyo. Sasago tunnel – one of Japan’s longest – links the capital to the city of Nagoya. Public broadcaster NHK quoted its reporter as saying that black smoke was coming out of the tunnel and there appeared to be a fire inside. Pictures from closed circuit TV cameras inside the tunnel showed a section of the tunnel of up to 100 m (328 ft) that had caved in on the Tokyo-bound lanes on the Chuo Expressway in Yamanashi prefecture. “We don’t know exactly how many vehicles are on fire,” a traffic police official told the AFP news agency. The official added that a woman was taken to hospital after she had made her way out of the tunnel. 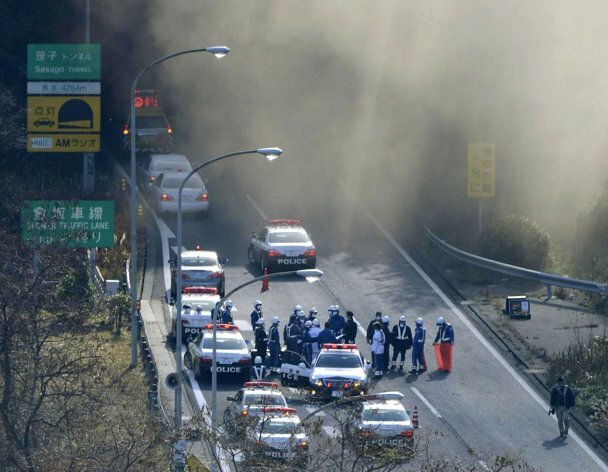 A reporter for NHK described driving through the tunnel as it began to collapse, seeing other cars trapped and on fire. His car was badly damaged, he said. Another survivor told the broadcaster that he saw “a concrete part of the ceiling fall off all of a sudden when I was driving inside. I saw a fire coming from a crushed car”. He added that he was “frightened” and walked for an hour to get out of the tunnel. The Sasago tunnel is an estimated 4.3 km-long (2.7 miles). The twin-bore tunnel is on one of the major highways out of Tokyo. The road has had to be closed because of the seriousness of the accident. Firefighters are still trying to extinguish the blaze. It is not clear what may have caused the roof to collapse. Japan is prone to large earthquakes, but none were reported in the area this morning. The tunnel’s closure is expected to bring traffic chaos as thousands of weekend travelers head back to Tokyo on Sunday afternoon.